After the 9/11, the USA applied Emergency laws to fight the terrorism which attacked them in their own Homeland. 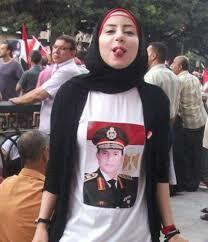 Nowadays, the United States of America is asking Egypt to remove the Emergency law because it is against democracy and freedom of speech!!! In Egypt, we are no longer astonished about what the American administration is saying anymore…America’s double standard is not a secret anymore. As long as a certain act doesn’t comply with their interests, they attack it; While if it suits their interests and practices, they bless it and support it even if it’s Crimes committed by terrorists against Humanity. Egypt continues fighting terrorism and is doing great. Here is some up-to-dates on that issue. From the huge quantities of weapons and wireless devices and equipment which work on long distance, you can really tell how much money were spent on terror acts to be executed in Egypt, in addition to paying terrorists as well. Terrorists are not that rich! Who is financing them! No need to guess, because it is all in that report and working according to the plan, except for one thing which doesn’t work according to that plan: The Egyptian Military is doing great in fighting weapons smuggling and arresting terrorists, even before they execute terror acts!! 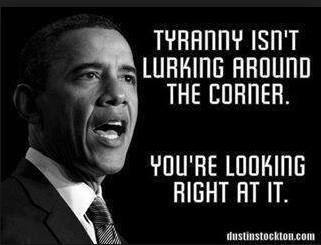 Bad News for Obama Bin Lyin! On 19/9/2013, Egyptian Army forces in cooperation with civilian police had arrested  individual elements Dangerous Extremist during a raid, North Sinai security Zone. The raid resulted in the arrest of  individual elements of jihad armed Extremists. 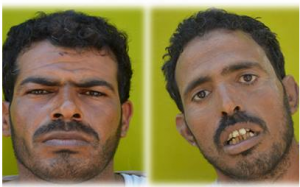 Names of some of the arrested terrorists: Hamdeen Salman Saad Hussein Jeridy , his nick name Abu Faisal – Hamid Greer Muslim Hassan – Asad Khalil Elbeik. 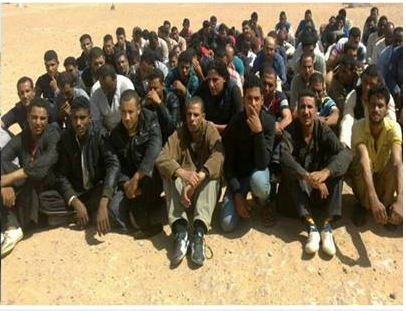 Those arrested involved in targeting security points of the army and police in northern Sinai. In addition, the security forces seized a number of vehicles, motorcycles and rifles, automatic weapons and computer devices. 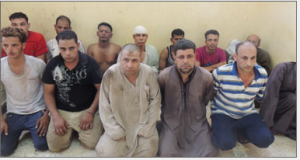 On 18/9/2013, The Egyptian Border Guards in coordination with the Navy , Managed to arrest some terrorists elements at the two northern and western military Areas and arrested the number of  individual from different nationalities. Individuals were preparing for terrorists acts through illegal immigration: [249 individual Palestinians – 134 individual Syrian – 12 individual Sudanese – 5 individual Bangladeshi – 1 Moroccan individual. All arrested individuals were handled to DA concerned Prosecution for all legal proceedings in that matter. The intensive efforts exerted by the border guards is taking place in order to secure the borders of the state on all strategic directions, as one of the most important main functions to terminate all attempts aimed at undermining the stability of the security of the society and harming Egyptian national security. 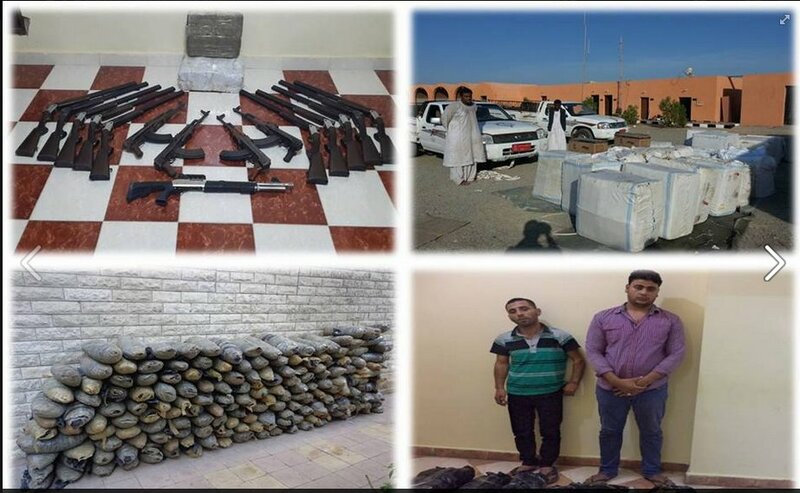 On 17/9/2013, Armed forces seized large quantities of equipment indicative before arriving at El-Arish, Sinai. 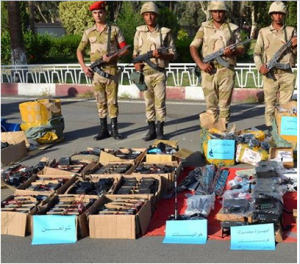 Operations carried out by the Second Army field, in cooperation with civilian police seized radio equipment hidden inside a truck during transit from Kantara West and it was in the direction to the town of El Arish. Military forces arrested outlaws elements working for Terrorist groups in Sinai in execution of terror operations against members of the armed forces and civilian police: [10 Station wireless Motorola Balmic “GM 300 with distance 15 – 30 km – 1 wireless Station – 11 cables feeding stations -20 station antenna – 40 station antennas cards – 198 Motorola-style” MT 777 distance 3-5 Km -125 Chargers devices MT 777 – 50 battery charger for the vehicle of the device MT777 – 200 antenna for the device MT 777 – 114 batteries for the device MT 777 – 50 clips batteries – 660 headphones Balmic – 20 battery Motorola GP – 200 Handset laptop Samsung devices]. 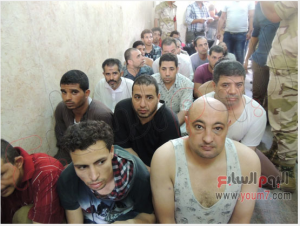 On 17/9/2013, Second Army Field Caught  terrorists involved in the murder of army and police officers Arish, Ismailia Cities. Military forces Managed to arrest a number  terrorists (Saad Soliman – Ramadan Awad Soliman – Suleiman Awad Soliman – Mahmoud Nasr Allah Suleiman), involved in the implementation of a number of terrorist attacks that targeted a number of officers of the armed forces and police Arish, Ismailia cities and led to their martyrdom. 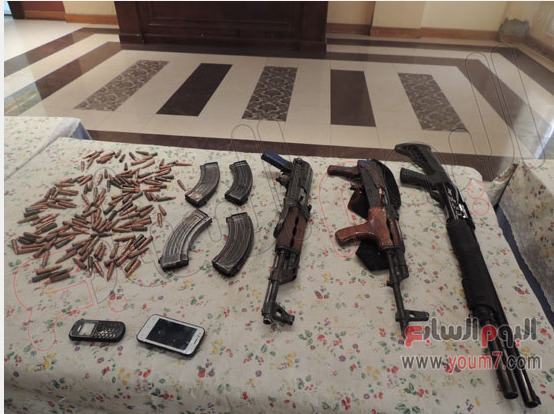 17/9/2013, Border guards stopped attempt to smuggle a quantity of weapons to the scope of the military western region. Border guards managed to seize the number of  Mobile Mid-sized inside them  rifle cartridges – 3.5 km west from Salloum City – Egypt. 11/9/2013 – At 08:45 in the morning, some terrorist elements used 2 vehicles loaded with large quantities of explosives targeted security forces in Rafah in northern Sinai. The operation resulted in the martyrdom of  military personnel and the injury of 17 others [10 military personnel – 7 of them civilians, including 3 women, as well as the destruction of a number of civilian facilities surrounding the incident. 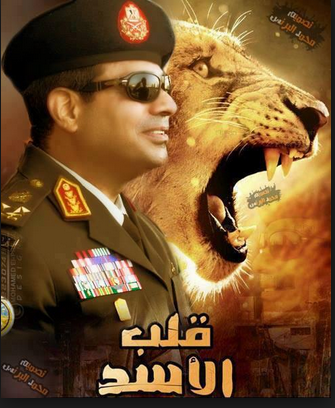 God save the land and the people of Egypt and and our brave military from sinful Terrorism, whether inside Egypt or outside Egypt. On 9/9/2013, Border guards seized an attempt to smuggle large quantities of weapons and narcotic substances and arrested smugglers. – Death [ 9 ] terrorists individual elements and the arrest of  others. -The destruction of [ 3 stores of weapons and ammunition – 107 hut – a collection of carriages used by terrorists groups as bases starting point for the implementation of the terrorist attacks . Military also seized quantities of explosives / blasting circuits: [ 5 ] Department improvised time detonate – [ 2 ] explosive belts – [ 1 ] mobile phone chip provider for remote bombing – [ 4 ] homemade explosive devices – [ 61 ] electricity bomber – Wires for blasting and processing tools IEDs. 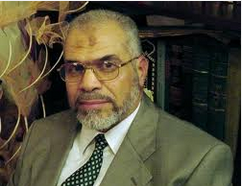 On 5/9/2013, Second Field Army forces arrested the Muslim Brotherhood leader “Rady Hussein” on charges of inciting attacks on police stations in northern Sinai – Bir Al-Abd Area, and paying terrorists elements to execute the killing and attacks against Military and police individuals, which resulted in the martyrdom of many soldiers and 4 police cars burning. 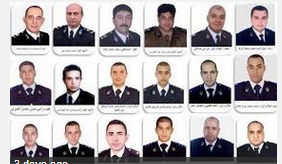 On 19/9/2013, The police and the military forces succeeded in Kirdassa Area – Giza Egypt – in arresting the Muslim brotherhood terrorists who slaughtered more than 11 police officers, generals and soldiers on 15/8/2013. Once the police and the military entered the area, terrorists started to shoot heavily at the security forces. 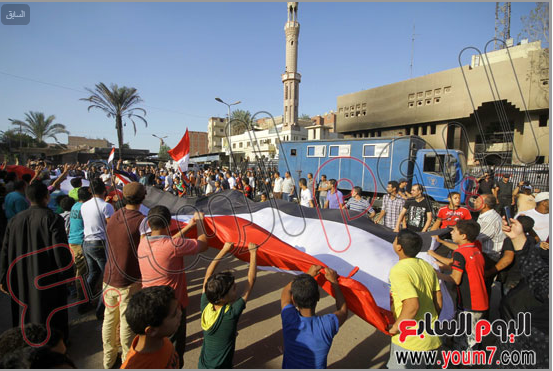 Muslim Brotherhood were threatened all the people who live in the area, if they dare to inform the police where they were staying. Many eyewitnesses testified that they were scared to leave their home buildings, because Muslim Brotherhood tortured their kids and threatened to kill them if they open their mouth. The operation resulted: the injury of many police and military individuals and the death of One Police General Nabil Farag who insisted on leading his police officers and be ahead of them and he got killed by a a Brotherhood sniper who was targeting police and military individuals from one of the roof buildings in the area. No civilian got injured or killed like Aljazeera Qatar Channel claimed on 19/9/2013, they claimed that the Police and the Military in Egypt have killed 3000 Egyptian civilians in attacking Kerdassa and those civilians are Brotherhood supporters!!!!! Police managed to arrest the leader of the slaughter massacre against police individuals on 15/8/2013, his name is Ahmed Shaklouf and turned out that he is a relative to one of the official media spokesman of Brotherhood his name is Mahmoud Guzlan and admitted that it is him that paid him to arrange that massacre against the police individuals. As the whole operation was recorded live by all the Egyptian public and private Medias minute by minute, Al-Jazeera channel First commented on the death of the Police General, that it is fake and what is on the General’s shirt was not blood, but it’s that stuff movie makers use in movies. Then when all the breaking news announced the death of the General, Al-jazeera Channel then claimed that the police and the military individuals killed the Police General, because he refused to arrest or attack Muslim Brotherhood Supporters in Kirdassa Area!!! I’m going to add the video of the death of the General which was recorded during the mission, so you realize the never ending forging and lying of Aljazeera Channel, which I personally consider that Channel “Media Whore” or when a whore talks about honor!!! What can a whore say about Honor!!! 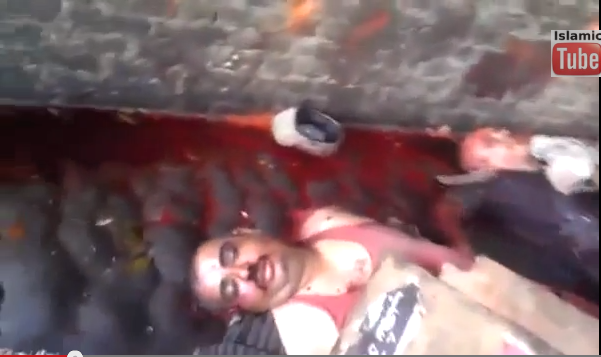 The following Screenshot of One of the terrorists who attacked and massacred The Egyptian Police individuals, carrying RBJ missle in attacking the police station on 15/8/2013 – His name is Mohammed Nasr Gezlany and he is one of the Terrorists who got a general presidential pardon from Mohammed Morsi when he was in power- that terrorist was in jail and his charge was bombing a popular area and killed many civilians during Mobarak’s regime in the 90. DA office arrested an Ex-MB his name is Mahmoud Amer Ex Egyptian parliament and he is a member in The MB political Party who paid Terrorists to commit the massacre against Police forces in Kerdassa Police station. 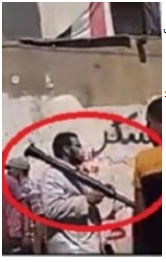 One of the terrorists who attacked and massacred The Egyptian Police individuals in Kirdassa police station – carrying RBJ missle to break in – his name is Mohammed Nasr Gezlany and he is a relative to Muslim Brotherhood leader Mahmoud Gouzlan and Ex- Brotherhood parliament member – Paid him and planned with him the masscres of more than 11 police individuals in Kirdassa police station. Kerdassa Police station massacre- terrorists tortured the police individuals – shot them and one of the officer while he was dying, asked them for a zip of water, so they finished him. On 19/9/2013, Military and police individuals managed to arrest the main Muslim Brotherhood terrorists who committed the massacre against more than 11 Police individuals – Kerdassa Police station 15/8/2013 – The following are the screen shots of the Muslim Brotherhood terrorists arrested in Kerdassa Giza. 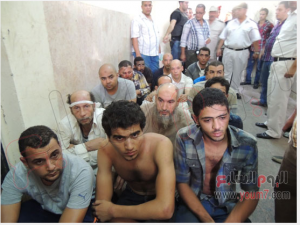 Screen shots of Muslim Brotherhood Militia terrorists arrested in Kirdassa – Giza charged of the slaughtering and massacre against more than 11 Police individuals in Kirdassa police station on 15/8/2013 – and weapons and ammunition found in their possession. 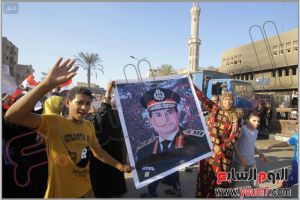 1/10/2013, The arrest of Nasr Gezlany, the man who break into Kirdassa Police station and set it in fire after he ordered Brotherhood supporters to pour bensin on the officers and soldiers bodies to burn them and burn the whole police station after they slaughtered all police individual. 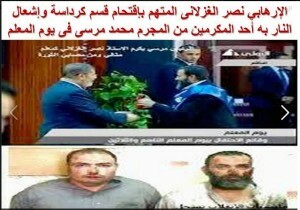 The big Shock is : that man is a brotherhood leader and as the following screenshot shows: first part Mohamed Morsi is rewarding him in the teachers days as an ideal teacher and one of the 25th jan participant and teh second part shown him after he got arrested. 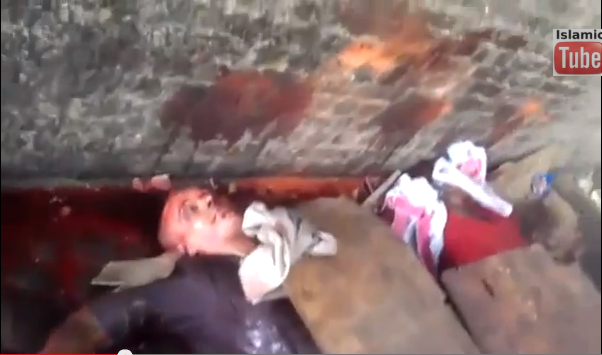 Brotherhood supporters recorded the slaughtered operation and that’s how the police recognized the murderer who appeared in the video committing that horrible massacres. 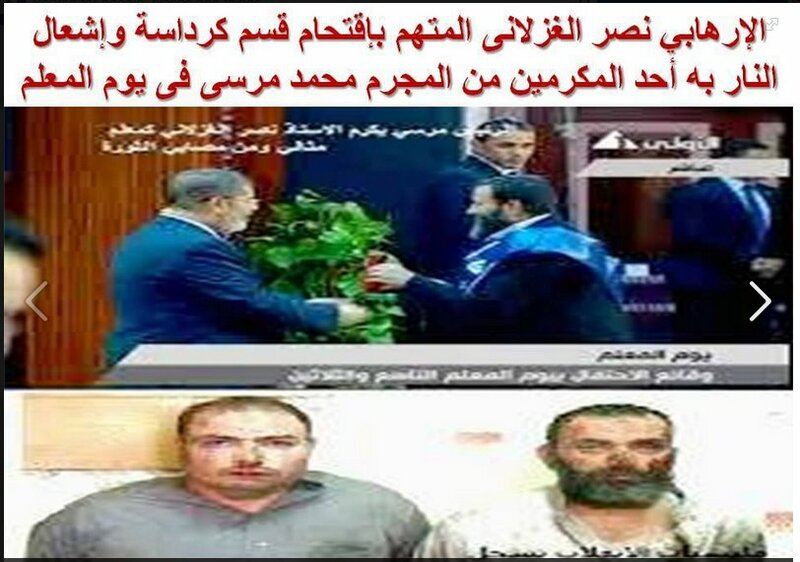 I’m sure if Morsi was still in power, he was going to give his guy a reward for being such a brutal and professional killer!!! The following Videos which were recorded minute by minute show the whole operation, including the sniper who shot dead the police General. Video showing the minute the security forces entered Kirdassa area. Video of the sniper who shot dead The police General from one of the roof buildings (the General was standing on his feet surrounded by his men, then one of the reporters and cameraman screamed sniper on the school roof up there! 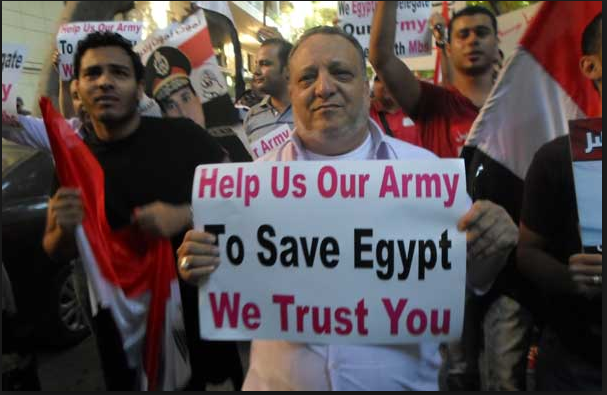 It was too late then) while the General was standing with his officers and soldiers, and his last sentence to them was:”Men, let’s protect our country and save Egyptians even if it will cost us our own souls and lives. It’s like he knew. As A General and a deputy of the General Security director of Giza Area, it was not a part of his job to be in the front row or even go with his men in the mission, but he insisted. He told his kids at home, that it may be the last time they see him. He is a father of 7 and 5 years old boys, got them after 30 years of marriage!!! Video of terrorists firing at the police and the Military at Kirdassa Area, from the classes rooms of Kirdassa school. 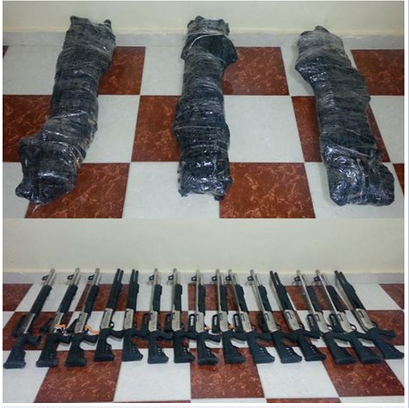 Security forces seized weapons,bombs, machine guns and ammunition with terrorists. Kirdassa area after the military and the police have cleaned the area from Terrorists. 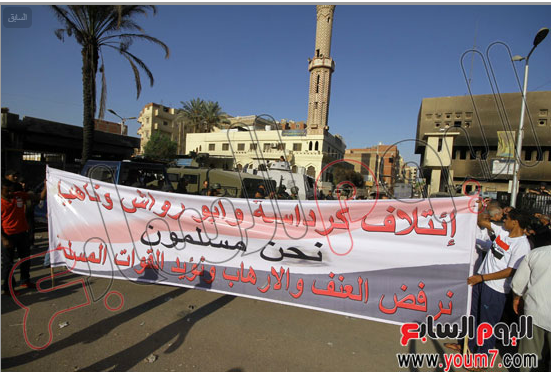 On the 19th of September 2013, two couples got married and made a big wedding in the area, they were not even allowed to do that when the Brotherhood were terrorizing and controlling the whole area. 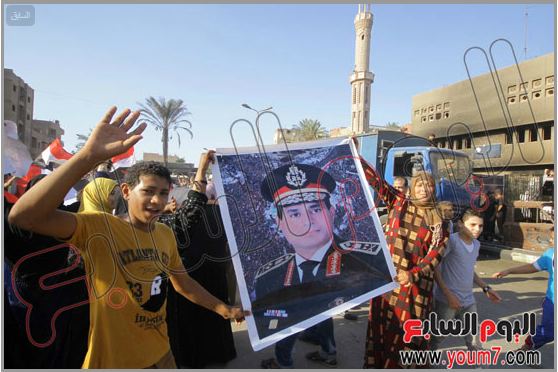 The following images show the people of Kirdassa area, thanking and appreciating what the military and police did, and were celebrating the Freedom. 20/9/2013, The following screenshots, showing the Egyptians in Kirdassa area celebrating their freedom with the police and military individuals. Strange that Aljazeera claimed that 3000 civilians got killed!!! 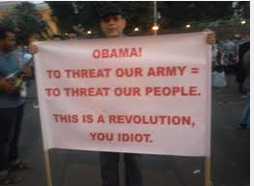 The only man who got killed was the Police General who was shot by a Muslim Brotherhood sniper and he got arrested. I’m not surprised at all, if AlJazeera will claim today that Maybe those 3000 persons came back to life again to celebrate their death with the whole neighborhood, then they will go dead later on after the celebration!!! 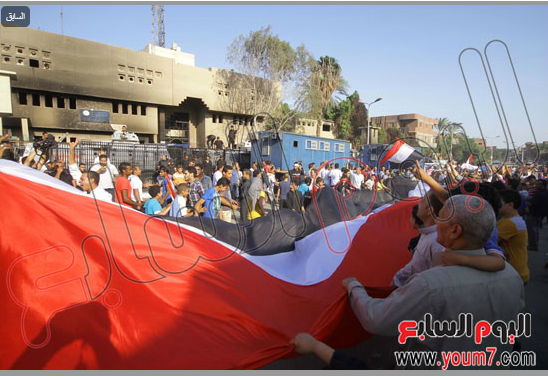 On 20/9/2013, Muslim Brotherhood as the Following video shows: In Nasr City Cairo area – Brotherhood supporters, throwing home building with stones just because they saw Egyptian flags and Minister of defense images and Military signs people authorizing their army to fight terror. They also tried to break into the building, to attack the people who were criticizing their violent attitude towards their private properties and their freedom of speech and expression. 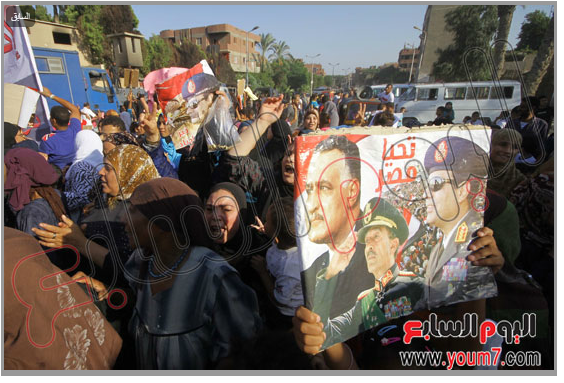 Violent MB demonstrators carrying Their famous Rabaa square sign with 4 fingers. 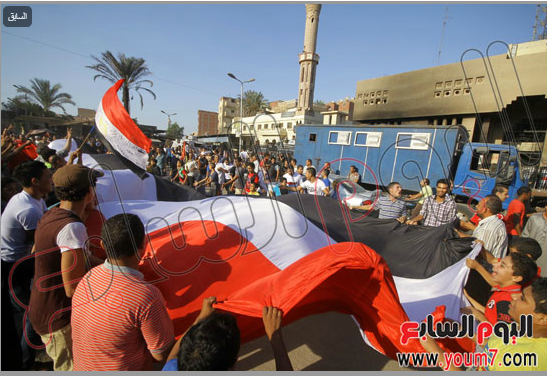 Of course since the disengagement of their violent bloody Sit-In in Rabaa and Nahda Squares, they have never succeeded in any mobilizing to their supporters at any times, the maximum they reach in any demonstration is 200 Persons. And it is always violent. 20/9/2013, The following video, Brotherhood insulting military individuals and tried their best in provoking the military individuals, they were saying to the military that Brotherhood are going to kill you and hang you all. – as the video shows, the Military guys, were smiling at them and were saying thank you very much, you are still our brothers and sisters, peace be upon you. 20/9/2013, Major General Secretary Police Izz al-Din, director of security in Alexandria City, got an official statement from a young female employee her name is Isra 23 years old with her colleagues and her boss as eye witnesses, that while she was at work, her fellow employee Muslim Brotherhood his name is Ihab 28 years old salesperson, he insulted her and asked her to cancel the ringing tine on her Mobile which was a National Song praising the braveness of the Egyptian Military. She told him that it was not of his business. So he went down to his car and came up and through her with benzene and lighted a match to burn her alive in front of her colleagues and Boss. Her colleagues managed to stop him and took him to the Police station. When the police search his car, they found knives and Benzene bottles. To use as Molotov. 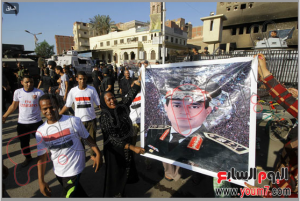 20/9/2013, Brotherhood supporters attacked a young boy in Mohandessin Area Cairo – who was teasing them with a military song, they attacked him and started beating him. 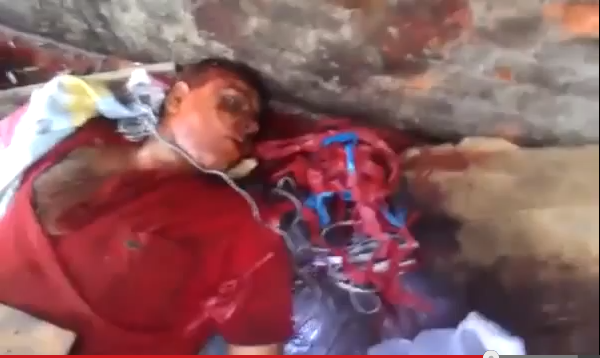 People in the street saved him and made an official statement against Brotherhood supporters.